I'm pretty light skinned and have fair skin and it's hard to find colors that look nice against my skin tone. The L'Oreal Paris Rouge Signature Lipstick is amazing! These colors are gorgeous and are really complimentary against any skin tone. Secondly, it feels like natural lip. There is no stickiness, no cakey feeling at all, no residue or transferring to clothing or glasses. 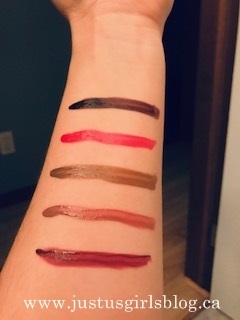 I can't believe how impressed I am with these lipsticks. These will be my new go-to lipsticks! I would definitely recommend these to anyone looking for a matte lipstick that stays put and feels like there's nothing on your lips. At first I wasn’t sure about this lipstick because it comes with a doe-foot applicator which I now LOVE. I love that the Doe-foot applicator goes with the shape of your lip and it applies nicely. After applying and using the lipstick, the performance is fantastic. As I mentioned, a little goes a long way. I can draw the lipstick on and it stays exactly where I put it, no traveling or bleeding. It’s lightweight and you can’t really tell that you have it on. Its lightweight ink delivers intense pigment with a weightless, bare-lip sensation that’s twice as thin as lipstick. This ultra-comfortable liquid lip ink provides lasting matte color and infuses lips with an even dye of color. Rouge Signature delivers the no makeup feel of a stain combined with the colour impact of a liquid lipstick. The Rouge Signature Lipstick is available in 16 beautiful shades, each in a see-through glass bottle paired with a doe-foot applicator to shape and line lips for a precise and perfectly applied lip! For more information about L'Oreal Paris Rouge Signature Lipstick and other L'Oreal products click HERE. March Break with Cineplex Events!